Monkey business. A Monkey on your back. Cheeky monkey, little monkey, monkeying around. Humans love monkeys. Kids are given monkeys. 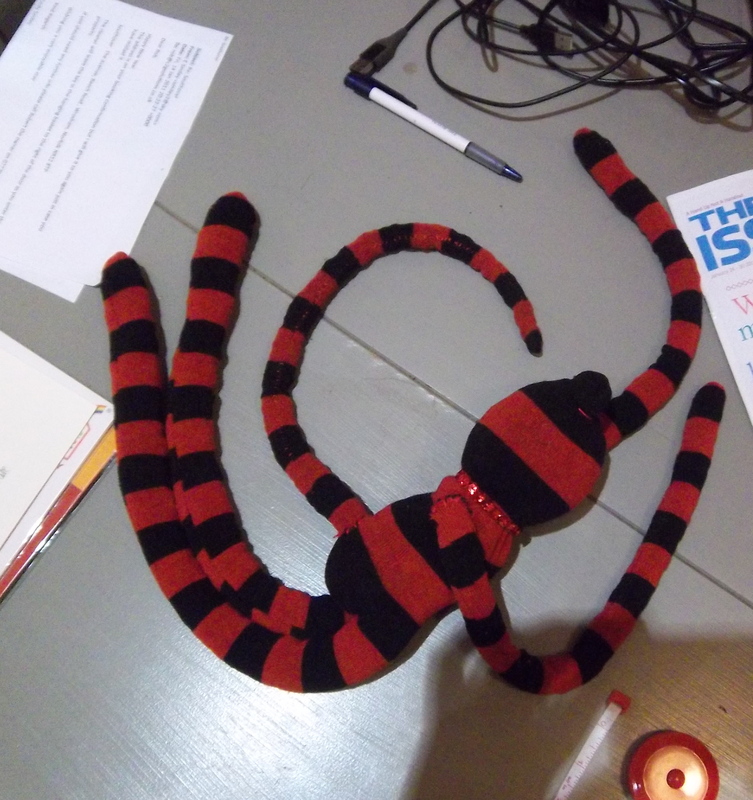 Since i started this project I’m seeing monkeys everywhere. The brilliant thing is how people are responding to the coffee monkey. I never really expected the monkey to catch on – i’ve been taking him with me like a child does with a favourite toy, introducing him to people, and while there has been a certain amount of nervous reactions (he is a little on the creepy side) people have warmed up to him really quickly and I’ve had a bunch of people asking if i can make them one. I’ve also grown rather attached to the coffee monkey – one of my ideas involved stitching his arms and legs into a solid shape, but i didn’t have the heart to do it, so i made another – The Bride of Coffee Monkey! Isn’t she adorable? she’s just full of beans, and is currently faceless, but i’m not sure if i want to change that. Although technically unfinished, she seems complete. My initial reaction was to prop her on top of the cone that the dutch lady, but after a bit of tinkering with the base i found it fitted nicely on a plate stand, giving me the possibility of utilising the mechanism to make a wall mounted automata, with a rotating background. More of this one later. the spinning both ways would be a problem for ‘tulips’, but ‘Fur Elise’ has a safety catch which clicks if you turn it the wrong way, which could be interesting. So the next step would be to buy one and check out the connectors, probably best investigated after the assessment next week.